Stepping onto the deck of the Steamboat Natchez is like taking a step back in time. Back to a simpler time, where you could lazily lounge on the deck of a steamboat, sipping iced tea and letting the calming tones of the jazz music lull you as you drifted down the grand Mississippi River. This experience is still possible when you book a steamboat river cruise in New Orleans. My sister and I boarded the Steamboat Natchez one sweltering night last week for their dinner jazz cruise. The harbor where the Steamboat Natchez is docked was only a short walk from our hotel in the heart of the French Quarter, but by the time we arrived we were drenched in sweat. 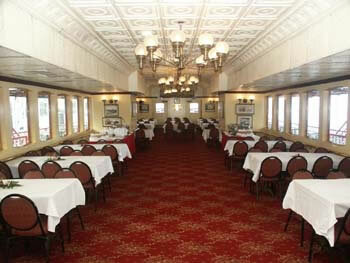 Being led into the main dining room on the Steamboat Natchez was a welcomed respite from the heat and humidity outside. Our server was bubbly and attentive, a combination I have learned to love and look for when being served anywhere. Our drink orders were quickly taken, and we were directed to the buffet. After all of the rich and decadent food I had been spoiled with at other high-end New Orleans establishments this trip, I did not have high hopes for the buffet food on this dinner cruise, but it was surprisingly good. While the baked chicken may not have been much to look at, it was quite tasty. The Creole style corn was flavorful, and the fried catfish was the best I have had anywhere. In fact, I may have gone back for another piece. We were in the first dinner seating, which began at 6:00, so the boat was still docked during our meal, but it was fun to people watch out the window at those below on the streets while we ate. Dessert was a common New Orleans treat of bread pudding, and was delicious. Once our meal was done, we headed to the back of the steamboat just as it was casting off a little after 7 p.m. I wanted to get a close up view of the impressive paddlewheel as it began to spin. A few shots later, and we found ourselves on the top deck resting in one of the many seats by the railing. Here is a tip, sit on the side of the boat facing the shores of New Orleans on the voyage out, so that you will not miss all of the sights that are being described. We sat down on the wrong side, and by the time we managed to find open seats on the other side, the narration was done. When the narration of the sights has stopped, the jazz begins, and can be heard no matter where you are on the boat. The Steamboat Natchez launched in 1975, so it has all of the modern conveniences and updated materials. However, the engine was taken from the tugboat Clairton which ran from 1927-1965. You can see the engine and other parts from the older boat when you visit the Steamboat Natchez engine room. Although, it is quite warm in there, it is worth it to see how the boat runs and read the different information on steamboat engines. On the return back to shore, be sure to stand or sit near the front of the boat so that you have a perfect view of the city of New Orleans all lit up in her evening finery. I grabbed some beautiful photos before the steamboat docked. If you enjoy boats, or just want a tour that lets you escape the heat a bit and enjoy a different view of the city, then the Steamboat Natchez cruises are perfect for you. There are several cruising options available. The Harbor Jazz Cruise departs each day at 11:00 a.m. and 2:00 p.m., with a live Calliope concert and optional Creole lunch, these cruises are a steal starting at only $27.50 for adults and $12.25 for children. The Dinner Jazz Cruise is available for $72.50 per adult with dinner included, and $34.00 for children ages 6-12. Have you ever been on a steamboat or jazz cruise? I received complimentary tickets for the Steamboat Natchez dinner jazz cruise for the purpose of review, but all words, thoughts and opinions are my own. This seems like such a fun cruise to go on and I love that they played jazz music! I've been telling my husband I want to go to Mississippi! This would be awesome! In the city we grew up in we had a steamboat/paddlewheel cruise that went up and down the river with a meal and all. That's what our school did for our Jr. High graduation - it was so fun. I'd love to do something like that again, you're pictures are so great. This looks like an amazing place to visit and eat! Unfortunately I have not. The only boat I get to go on is my husband's bass boat. How fun! I would love to go on a steamboat cruise. It is embarrassing that I was born in Louisiana, lived in Houston, have family in Mississippi,my son and IL were just in New Orleans for the Jazz Fest in the Spring...and I have never taken this trip. It is on my bucket list. Beautiful pics. No Beth, it happens that way sometimes. I live an hour and a half from Panama City Beach and have never gone, yet it is a huge tourist draw. Not the same as New Orleans, but still. You definitely try to get there though! That looks like so much fun. I'd definitely love to do something like that. I have never been on either of those. I would love to sometime though. We didn't get a chance to sail on the Steamboat Natchez on our last visit, but it's on our list next time. Love the pictures! I haven't been on either would, but it would be a fabulous experience.